Stick welding is one of the most common welding process. Materials used for structural applications have continued to lend themselves readily to the process, making stick electrodes a prominent choice. Stick electrodes provide the chemical properties necessary for such applications, along with the low hydrogen levels needed to prevent issues like cracking. They also provide the appropriate mechanical properties for these jobs — most steel used for structural applications requires filler metals that offer 490Mpa of tensile strength. E4918 stick electrodes meet those specifications. 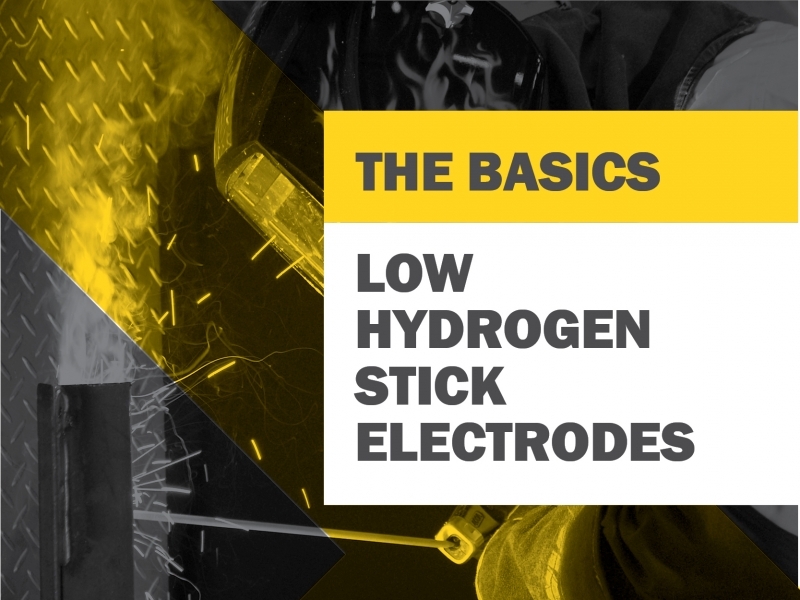 As with any part of the welding process, knowing the basics about E4918 low-hydrogen stick electrodes can help in understanding their operation, performance and resulting welds. We’ve put together some things that should be considered. E4918 stick electrodes are a good choice for structural steel applications due to their smooth, stable and quiet arc, and their low spatter levels. These applications require careful attention to heat input and are typically on strict deadlines, so it’s important to have a filler metal that gives the welding operator good control over the arc and one that will minimize the need for post-weld clean-up, allowing better productivity. These stick electrodes also offer good penetration (“medium penetration”) so welding operators who use the right technique can typically avoid weld defects like lack of fusion. They also offer good deposition rates, allowing welding operators to add more weld metal into the joint in a short amount of time. This characteristic is made possible because iron powder has been added to the coating of the stick electrode. Manganese and silicon (which must be present in specific levels in all E4918 stick electrodes) also provide advantages. These elements work together as deoxidizers to help weld through certain levels of dirt, debris or mill scale that can be commonly found on structural steel applications. E4918 stick electrodes also offer good arc starts and restarts, which help eliminate issues like porosity at the start or end of the weld. If restriking is allowed, it’s necessary to remove the silicon deposit that forms at the end of the stick electrode to initiate an arc again. Note, however, some welding codes or WPS procedures do not permit the restriking of stick electrodes. Always consult with the specifications for the job beforehand. E4918 stick electrodes are designed to operate with power sources that provide an AC or a DC current. During AC welding, the additional arc stabilizers and/or iron powder within the filler metal coating, makes it possible to maintain a stable arc, even when the power source cycles through the alternating currents (at up to 120 times per second). E4918 stick electrode welds may not be as smooth, because of the continuous changes in the direction of the current. Alternatively, welding with a DC current can make controlling the arc easier and it can gain a more appealing weld bead because the direction of the current flow is constant. To gain the best results, follow the manufacturer’s operating parameters recommendations for the given E4918 stick electrode diameter. For an E4918 stick electrode, maintain a good leading angle and “drag” the stick electrode along the weld joint. A 3 to 5-degree angle is ideal for vertical up welding, and employing a slight weaving technique works well in this position. In the flat and horizontal positions, maintain a tight arc length, ideally, keeping the stick electrode almost on top of the weld puddle. Doing so helps minimize the opportunity for porosity. A good rule of thumb is to maintain a weld bead width approximately two and a half times the diameter of the core wire inside the stick electrode, for flat and horizontal welding applications. For vertical up welding, try to create a weld bead width around two and a half to three times the size of the core wire. Wider weld beads than these recommendations increase the potential for slag inclusions, which compromise the integrity of a structural weld. Because of the low-hydrogen designation of E4918 stick electrodes it is important to protect from moisture damage, it is important to keep that package intact until the products are ready for use. Also keep the stick electrodes in a dry storage area. Once opened, welding operators should handle the stick electrodes with clean, dry gloves. This will prevent dirt and debris from sticking to the products’ coating and eliminates the opportunity for moisture to be pickup from the welders’ hands. Once opened, stick electrodes need to be stored in an oven at the temperatures recommended by the filler metal manufacturer. Certain job codes may dictate how long a stick electrode package can remain open on a jobsite and how often the product can be reconditioned in a holding oven — frequent reconditioning can degrade the outer coating and minimize the product’s shelf life. Always consult with the specifications and codes for the requirements on each job.